There is a castle on Rt. 1 in Hyattsville, about a mile south of East-West highway. It is now the Emanuel Covenant Church. I think it was originally a National Guard armory. As for the one in Hyattsville. My sister-in-law tells me that it was once a resturant as well as an armory. That building is the Hyattsville Armory, built in 191x as a National Guard Armory, rebuilt in 1985 to be a theater/restaurant/shops, went broke a couple of times, taken over a few years later by the church. I think you should not call it an Unknown Castle any more. I'd suggest naming it the Hyattsville Castle. I think I'm as familiar with the building as anyone (I was very involved with the restoration in 1984-85). Hyattsville is proud of it, and of its restoration. I understand that the building is NOT available for wedddings. I actually visited the castle yesterday to take pictures and it was really neat. The Hyattsville Armory building was designed and built as an exact model of Windsor Castle - 1/4 scale. 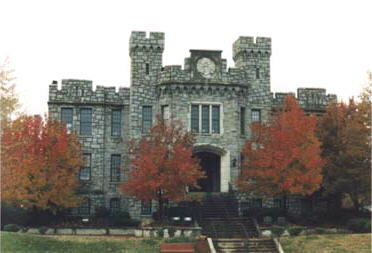 The Maryland National Guard Armory was housed in an imposing structure at 5240 Baltimore Avenue, which was built in 1918 (individually listed on the National Register of Historic Places). The castle-like granite stone structure is nine bays wide on the facade and three stories in height with full-height English basement.